Alan Jacobson is the national bestselling author of the critically acclaimed thriller, "The 7th Victim," which was named to "Library Journal"'s "Best Books of the Year" list for 2008. Alan's years of research with law enforcement, particularly the FBI, influenced him both personally and professionally, and have helped shape the stories he tells and the diverse characters that populate his novels.Both "The 7th Victim" and one of Alan's forthcoming thrillers, "Hard Target," are currently under development as major feature films with an A-list Hollywood producer.Visit Alan at www.AlanJacobson.com. 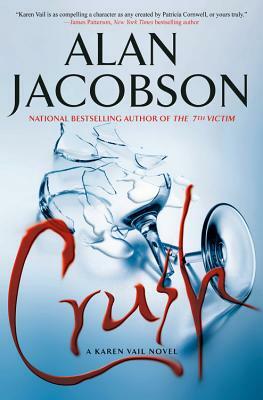 For more information on Crush, visit www.CrushNovel.com. "Action-packed story (with) plenty of bark and bite, sizzle and emotion…a tangled tale of delightful intrigue. Well done." "Set in the Napa Valley, Crush is a smart, stylish whodunnit with lots of surprises and a finish with all the punch of a blockbuster Cabernet."